Been busy frying and roasting. Yesterday’s edition was dosa milagai podi.This came out very well this time. 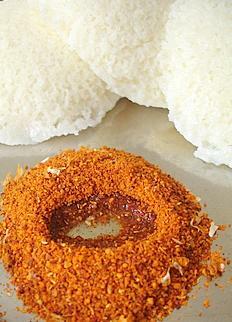 I have to now get the curry podi, sambar podi, parupu podi, and ellu podi going. I plan to do that on Monday. I am actually making a “to-do” list now, because of the amount of work that has piled up. The good news is that uncle and aunty are also back in town and it was wonderful seeing them again. By the way, we saw Anuradha yesterday with the stunning Leela Naidu. I didn’t catch the whole movie as I still have a lot of catching up to do with work – but as Sury kept saying, you would have really enjoyed the movie. Among other things, I now have Albela and Baradari – 100% musical treats. Ah, what lovely memories – these were the very first movies I saw on TV at Ms Kumud’s neighbor’s house back in 1973. Here’s our favorite lori from Albela – remember how Vidur thought I was singing it when he heard it on TV for the first time? He looked totally surprised to realize it wasn’t me – talk about compliments! Something awfully sad happened a few days ago – an AI flight from Dubai to Mangalore crashed in Mangalore, wasting the lives of 158 people, of which four were children. They are still in the process of identifying some of the bodies. It is terrible to even imagine something like this – but life always dishes up facts stranger than fiction. With events like these, who has time for petty stuff? It is obvious that there is one life – and we should live it in a positive way. Something lovely happened too, on Sunday. Tanu phoned – and it was absolutely great talking to her. Some things never change – and we couldn’t stop laughing over the fact that we’ve known each other since 1974 !! I ought to scan some more photos – she doesn’t have copies of our pictures together since I was always the shutterbug. Now this is good motivation to preserve the photos. There’s more good news – I am going to be working on a fabulous new project and am very much looking forward to it. I know you’re out there, watching over me. Now, I just need to work some effective time management. In the meantime, we’re also doing our bit for the environment through a “wealth out of waste” program. We’ve roped in the BBMP to come once a week and pick up the segregated waste plastic and paper we don’t need. Its the YIMBY principle. So far, so good – successful for three weeks now. Ok – going for that second Kaapi and to get ahead in the day. There are miles to go before I sleep! The flow and narration of your thoughts in this blog are amazingly lucid and as crystal clear as a bottle of Perrier mineral water. Your break has done wonders for your writing skills. Keep enthralling one and all with precious nuggets such as this. Wishing you luck and the blessings of your Mom in your new project.